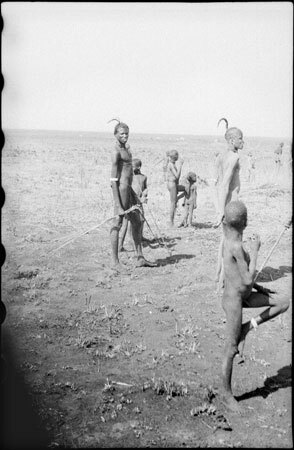 A group of Nuer youths and smaller children in the savannah with cattle visible in the distance. The youths are wearing single feather hair ornaments, as well as ivory arm ornaments. Morton, Chris. "Portrait of Nuer youths" Southern Sudan Project (in development). 03 Jan. 2006. Pitt Rivers Museum. <http://southernsudan.prm.ox.ac.uk/details/2004.130.32814.1/>.